The Bharatiya Janata Party's (BJP) performance in the recent Lok Sabha election and its growth has been truly exceptional. More shocking is the fact that Congress has been reduced to less than 50 seats. If you recall, in the 1984-85 elections, that were held soon after Indira Gandhi's assassination, Rajiv Gandhi, who was riding on the sympathy wave, had got a huge mandate. Congress had 426 members, while BJP had just 2 in the eighth Lok Sabha. Who were these 2 BJP MPs who had won in the 1984 election? Dr AK Patel had won from Mehsana in Gujarat. 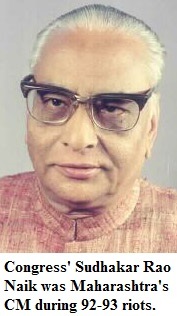 The second BJP MP who had won during the Rajiv Gandhi wave was Chandupatla Janga Reddy, who had won from Hanamkonda in Andhra Pradesh. Even Atal Bihari Vajpayee had lost in the election. In the parliament, Telugu Desam Party (TDP) was the main opposition to Congress. NTR's party had 30 members followed by CPI (M) that had 23, AIADMK (12), Independents (9), Akali Dal (7), AGP (7), CPI (6), Congress S (5), Lok Dal (4), Unattached (4). The BJP was much behind, along with Kerala Cngress, DMK, Muslim League and the nominated, who were two each. But within a few years, Rajiv Gandhi's popularity saw a decline. The BJP began mobilising people in the name of Hindutva. As Ayodhya movement gathered steam, Rajiv Gandhi took such steps that proved costly to the party. Either it was 'shilanyas' or the Shah Bano issue, both hurt the Congress in the long run. 'Mr Clean' VP Singh raised 'Bofors' issue successfully and BJP strength went up from 2 to 86. The National Front-led by VP Singh came to power but ultimately the Ram Janmabhumi-Babri Masjid issue led to the fall of the government. Despite the communal frenzy, the BJP could not manage to form the government. Its reach was limited to North India then. Another reason was that Congress was still a sort of 'default party' to vote for, in most parts of the country. After that, the BJP improved its tally. But despite Atal Bihari Vajpayee at the helm, it could never cross 200. It hovered between 121 and 189. Even in the beginning of 2013, the BJP appeared to be a divided house. But then Narendra Modi was chosen to lead the party and steadily the campaign picked up steam in later months. The result was astonishing as the party could a majority on its own. This was only the second time when a non-Congress government managed to form government on its own. In 1977, after emergency, it was during the anti-Indira wave, that the Janata Party (JP) had managed to win over 300 seats. But even then, the Congress was a strong force with more than 150 seats in Lok Sabha. Even before BJP's rise, there were right-wing parties but they were fringe players. Either it was Jan Sangh, the Ram Rajya Parishad or the Hindu Mahasabha, none of these political parties managed to capture the popular support. Indian voter had other alternatives. It was only in the fourth and fifth Lok Sabha that Jana Sangh seemed to be emerging as a bigger group. Else, these parties remained on the margins of Indian polity. However, the Congress' failure led to the growth of BJP in the last three decades. But 2014 proved to be watershed, as decisive victory to BJP is another thing and the decimation of Congress is another aspect. The party's dismal performance shows how Congress has failed to put forth its ideology and hasn't been able to connect with youths who seem to have less appeal in Congress' vision and are drifting towards the right-wing. If it was just an exceptional election, then it's ok. But Congress can't afford to be complacent. No big state in India remains with the Congress, either in North or in the South.Is the BJP becoming the default party for a majority of Indians, especially, the youngsters! Congressmen have to draw lessons from this defeat. Will they? 1. Muslims' disenchantment with Congress: "I am not a Congress supporter but glad at its loss"
An Indian Muslim's letter to Congress leadership: "I am not a BJP supporter but I am glad to see Congress' defeat in Lok Sabha election"
I am not a BJP supporter and there is hardly any chance that I would ever be in future but the rout of Congress in Lok Sabha election 2014, has given me satisfaction. I find strange that some of my Muslim friends were gloomy at the Congress' loss. I have always found this mental slavery as nauseating. I would have understood had they been disappointed with the performance of non-Congress, non-BJP parties. Or if you are die-hard anti-BJP man, the stellar performance of the party [and NDA] may have been disappointing for you. But sadness at Congress' defeat is just not understandable to me. 1. Congress is the party that can get away with 'massacres' and 'genocides' without even a whimper. Imagine, how more than 50 Muslims were killed in Assam recently, and it was no issue for the 'secular' party. Within three days, it was all forgotten, buried. There was no demand to sack Tarun Gogoi, who now offers his resignation for poor performance in election! Just over a year ago, there was similar massacre in Bodoland in Assam. Which other party would have been able to skirt it so easily? Congress did, and nobody, not even media, questions it. 2. Congress does hardly anything in terms of welfare measures or preferential treatment for Muslims, yet gives the impression, that it has 'appeased' Muslims for ages. It doesn't even deny this false charge, because it suits it and helps it gain sympathy of minorities and their votes. Where in India are Muslims appeased? Are they in government jobs or private sector? Riots, encounters, killings, continue unabated and yet the minorities are appeased. Wonderful strategy. 3. All the parties talk about Gujarat riots  and then it goes back to Congress' failure in handling the anti-Sikh massacre [riots] of 1984. But how conveniently, Congress forgets all the riots during its regime until recently [Assam]. The riots of Meerut, Moradabad, Bhagalpur, Ferozabad, are history. But what about 1992-93 Mumbai riots, when in two separate rounds, more than 2,000 people were killed. That is recent history, much after 1984. Isn't it? Sudhakar Rao Naik was Chief Minister of Maharashtra then. Yet, Congress that always promised to implement the Sri Krishna Commission report, never honoured the promise. Prosecution sanctions were not given even in cases against police constables who had opened fire on innocent Muslims, let alone officials. Congress and its bureaucracy was always intent to saving the killers of Mumbai riots, and other riots. There was never firm action. Had the Congress acted against BJP and Shiv Sena's men involved in riots, history would have been different. But it remained soft and today, it is almost finished. 4. After its defeat in late 90s, it realised that it had lost Dalits, Tribals and Muslims, its core vote. In 2004, when Atal Bihari Vajpayee's government lost, Congress again came back to power. The justice Rajinder Sachar panel was appointed to submit its report over the socio-economic condition of minorities. The panel's report clearly showed, how much disadvantaged Muslims have been, and how their representation is low, in jobs. But for the next ten years, it didn't do anything. The party perhaps felt that it would invite 'majority backlash', which has come anyhow. How it feels, Sonia ji, Rahul ji? 5. In the last ten years, Indian Muslims suffered the worst. There were indiscriminate arrests, fake encounters, branding in the name of terror. It was repeatedly revealed in reports that Congress-ruled Maharashtra led in atrocities on Muslims. Azamgarh was defamed during Congress rule. BJP was not in power, either in UP or at the Centre. But Congress did nothing to erase the perception or take action against those who used such words. Its police, special cell, and agencies, went on with their actions. Yet, the genuine demand for a judicial probe in Batla House encounter, was turned down. We don't ask you to speak or act for us but we expected you to be at least transparent. You did nothing. In fact, in cases against right-wing extremists too, there was slackness, as you feared 'backlash'. Bureaucrats fed you and you believed it, more so, because that was your intent too. Have a nice time, you deserve it. When the trends were coming and it showed 50-55 seats, I wished you would go to less than 50. It happened. 6. Either in Dhule or in Gopalgarh, Muslims were shot in the chests and head. All these were acts of unprovoked firing. The police were controlled by your government in both states then. But as always, Rajasthan and Maharashtra chief ministers did their best to hush up these incidents. There is no end to such cases if one starts compiling. The problem is that the mindset is such that atrocities under Congress rule were ignored. Congress was not questioned [even by media]. It may seem harsh but it is the truth that Congress' secularism was flawed, yes. It lowered the bar and still gave the impression that it was appeasing minorities, though it did the opposite. Just barely a month ago, in Maharashtra's Mumbra, excessive police action took place, and there was no action by Prithvi Raj Chouhan government. Citizens are rid off the arrogant self-styled champions of minorities, great. SCARED OF ACTING AGAINST TOGADIA! 7. There is tremendous talk of 'appeasement' but whenever there was a case of 'hate speech', Congress governments had a selective approach. Muslim leaders like Owaisi and Imran Masood were booked and jailed and it was a welcome move. But Pravin Togadia was never arrested. 8. Muslims and Christians among Dalits, Tribals [SCs, STs] can't get benefit of reservation. It is not a law passed by parliament that can make such a distinction that certain communities or religious groups alone are entitled to reservation, while the rest are not. The discriminatory distinction was made possible by 'secular' Congress through the backdoor entry. They had brought a Presidential ordinance to ensure that the backward Muslims or Christians don't get the benefits of reservation. They have succeeded in it for over 60 years. Despite protests, there has never been a slight attempt to undo the historic injustice. 9. Whether you like it nor not, the BJP has an ideology. Congress doesn't seem to have any ideology. All these years, when BJP targeted it for 'appeasement', Congress did little to spread its ideology or tell its people, or cadre, why secularism is important. On the other hand, in states, RSS kept expanding. Wherever BJP formed government, the dozens of RSS' institutions in diverse fields, expanded. They got land and all possible help. Today, they are running colleges, hostels, orphanages, doing social work. In process, its workers and sympathisers also got financially independent. Naturally, they had the freedom to spread ideology while they had no worries about doing something else to earn money. What was Congress doing? Its ground workers have nothing to do except 'kaam karwane ke liye paisa lena, playing the role of middle-men, the euphemism for bribe, for survival. 10. Congress attacked the Rashtriya Swayamsevak Sangh (RSS), quite often. Its leaders even blamed the Sangh for its cadre's involvement in extremist acts. Definitely, lot of people were arrested. If Congress wished it could have banned the Sangh long back. It didn't. When people belonging to banned groups are arrested, no one questions or asks if they are indeed member of that group or have a membership receipt. In the case of Sangh, the defence was always that the person may have been a worker but had left us and we keep no record. Who taught this strategy to them and how you believed it, innocently. Either it had no evidence or it lacked the will. Digvijay Singh was most vocal and said that he had record, but why these records weren't used? Had Congress acted tough, the Sangh wouldn't have grown so powerful. Today, the Congress may have realised the RSS' strength. The Congress often said that if BJP came to power, it will be bad for minorities, especially, Muslims. This is unjustified and only aimed at keeping minorities at the Congress' side. In 1977, Muslims like the rest of India, voted against Congress. Earlier, SVD governments had come to power in many states. In later years, non-Congress governments became the norm in many states. NDA came to power at the Centre. 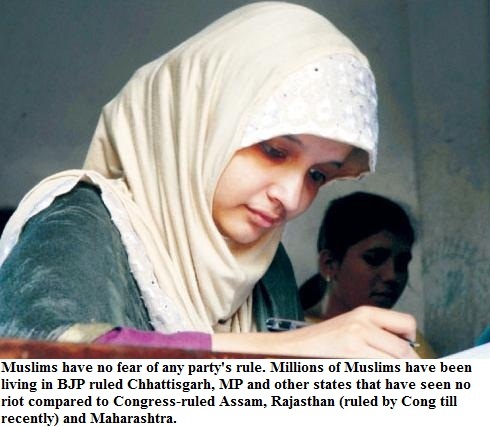 In states like Madhya Pradesh and Chhattisgarh, Muslims have been living in BJP rule, without riots, and in a much better situation than in Congress-ruled Maharashtra or Assam. Muslims are no cowards who would tremble at anyone's name. It is a democracy and citizens have the right to change the government. If India decided to throw you out of power and vote the BJP, then this is also a welcome mandate. Muslims have no fear or apprehension, after having suffered innumerable riots in Congress-regimes as well as BJP and other regimes in the past. 12. The list of damage done by Congress to Muslims is long. The Congress in UP, after independence, acted with vengeance against Muslims. It is the only state in India, where despite being an official language, Urdu medium schools can't be opened. This is violation of the universal right of a child to be able to study in his mother tongue, and a question of principle and rights. As a result, poor Muslim families who can't afford educating kids in private schools, have no option but to send their children to madarsas. The law hasn't been changed, despite protests for decades. More than 10 lakh signatures were collected, loaded in truck and taken to Delhi, long back by Zakir Husain. Still, nothing happened. Muslims abandoned Congress in UP-Bihar, and later in the rest of India, wherever there was a third option. Initially, I thought, it should be titled as 'Letter to Rahul Gandhi (or Sonia Gandhi), but later I realised that perhaps it is all futile. For ten years, they run the government but couldn't honour the basic promises like implementation of Sachar panel report, then what's the point of expecting it from them. If an ordinary Muslim wants to talk to Congress, there is no option. Other parties and their leaders are on Twitter and Facebook. But not Rahul Gandhi. People don't even have the satisfaction that they have at least conveyed their concern or sent their suggestions. If you try Congress' in-house portal, Khirki, then also there is no response. I don't know if Rahul Gandhi has ever visited any ordinary Muslim's household to talk about his aspirations and expectations. So-called 'elite' leaders like Salman Khurshid or others like Ahmad Patel are considered 'Muslim leaders'. Numerous delegations met Congress leaders and PM Manmohan Singh about indiscriminate arrests of Muslim youths, about false terror cases, about inquiry in Batla House, and other issues, but there was never any action. This blog has been running for almost a decade now. On this blog earlier too, I criticised Congress more often. As there was expectation from it. There was perhaps a feeling that it will ever take some corrective measures. But Congress couldn't listen and understand. It is this party that has treated Muslims and many other sections of the country, like dirt. No wonder, Muslims voted for AAP and other parties, wherever they had an option. In Delhi, in all seats, AAP emerged second. One would probably be a fool to imagine or hope that Congress will learn. In fact, it will just hope that five years later, people would give it a chance again. But that is plain wishful thinking. Trend of talking about morale of police force if action taken against police for killing an innocent: Journalists siding with killer cops, showing insensitivity towards victims! 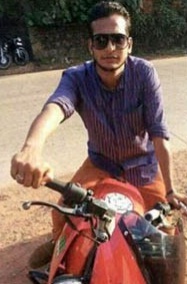 In Karnataka, Anti Naxal Force (ANF) constable Naveen Naik had killed a youth, Mohammad Kabeer, 23, by firing him with AK 47 because the policemen 'mistook' him to be a Naxalite. This news didn't make it to national headlines, especially, in North India because of the Lok Sabha elections. The incident had occurred last month in Chikmanglur. The policeman, Naik had shot at Kabeer repeatedly. He fired nine rounds. Three bullets hit Kabeer, who died on the spot. It was clearly a case of extra-judicial killing. 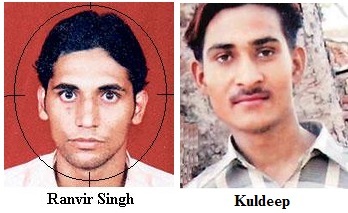 After the murder, the defence of the ANF was that they 'suspected him to be a Naxal'. It was too big an offence to be hushed up. The effort to paint him as 'illegal cattle trader' to get sympathies of right-wing and turn it into a communal issue also failed, as it was a clear case of murder in cold-blood. The BJP was against booking the policeman and its state chief even opposed compensation to the youth's family. BJP leader CT Ravi said, "The incident was accidental, no doubt....but youths have been involved in illegal transportation of cattle". The BJP leaders said it was 'appeasement'. Isn't it shocking that for BJP, even a murder is appeasement! In several regions in Karnataka, Bajrang Dal and Ram Sene have created frenzy in the name of cattle trade. It has become a big extortion industry, and it is used to demonise the minorities. In fact, it was not just politicians, but police officials and bureaucrats also tried their best to save the policeman. There were attempts that the case of murder was not registered apart from objecting to the accused policeman's arrest also. It was clear that many police officials wanted to save Naik. Even Home Minister KJ George earlier spoke in the same tone as the opposition party. After CM Siddaramaiah's intervention, and due to rising anger and protests, the accused policeman was booked and arrested. However, the case was not handed to CBI despite demands from different sections of civil society. The CID has been given the task to conduct an inquiry in this case. Kabeer and his four companions were travelling in a pick-up truck when they were stopped. The allegation was that Kabir tried to escape and ANF commando (constable rank) shot him dead. On April 27, Indian Express reported, 'ANF has not halted operations over constable arrest; Home minister', a six column lead news on page 2. It said that 'home minister denied reports that the ANF went on strike in protest against Naik's arrest', in the end of the story. Which reports? Express didn't clarify. In fact, after any such incident, it is quite often seen how stories are 'planted', about 'the morale being down among cops'. So are cops emotion-less, killers? No. Policemen also have families and many of them are just and unbiased. They are aware, what it means when an innocent is killed. However, planted stories are aimed to creating pressure on government. So whose side are you? For the victim or for the killer? Let the law takes its own course and the case be tried in court. Actually, the Indian Express itself carried a report by Harsha Raj Gatti, which says, in the first paragraph that the ANF has suspended its operation attributing it to 'sources', (no official or ANF sources either), though in the second para, it carries Home Minister's version that the ANF hasn't gone on strike after the cop's arrest. Read further, it says, "Sources in ANF said night patrolling and combing had come to a halt and only occasional daytime patrolling was being carried out following a drain in morale after ANF constable Naveen G Naik was arrested for shooting the youth, Kabeer." Again, the talk of low morale! Which policemen said it? Or who asked the journalists about it? Are we a banana republic where cops have the immunity to kill and if they murder someone, they should not be arrested, because it will affect their morale? Is it a military ruled country or dicatorship where citizens have no rights or no sense of jusice? Here again, Indian Express reported that how 'probe' 'reveals' that ANF cop fired when the youth fled. Apparently, there is nothing too shocking in this news report. But it, in fact, suggests that the cops fired because he fled, as if it was justified! How innocent. The fact is that the youth was not a Naxalite at all. But he was killed, though he was not wanted for any offence and had committed no crime. But journalists 'intelligently', do their bit, trying to make it sould differently, and watering down the cop's crime. If you read all these reports [see links below] you will find not an iota of sympathy for the victim or his kin. Strangely, you find how there is an attempt to water down the crime by talking about , 'bullets were not fired on chest', 'report saying he was shot when he fled', and about 'morale affected' without any substantiation or quotes. It is not about singling out Indian Express. It is about how section of journalists for whom there is no relative sense of justice. The journalists who should be totally unbiased [if they are not concerned towards citizens] seem to be taking side for the men in Khaki, even if they err. This is a sad trend for journalism and the society. Newspapers should talk about getting justice for the common man. Ironically, in the cas of poor, or those who are not VIPs, such killings are treated in a similar manner. However, if police raids a joint and catches VIP's kids snorting drugs, there is talk of police excesses and need for action. Journalists interact with officials and policemen on a regular basis and somehow get more 'protective' of the policemen, rather, than doing their own job. 2. If policeman kills an ordinary or poor man in custody, there are less attempts to get the versions of victims' kin. Rather, the versions of policemen are prominently published. A superior officer's statement about 'we will look into it' or about clean-chit is promptly published. The reason is that speaking for the victim doesn't help you, however, the cops' clout helps journalists in their daily lives. So it is, probably, always more 'useful' to file reports about cop's morale so as to be on their side and keep them in good humour. 3. When policemen catch women for flesh-trade and parade them, to show their success in catching a major crime, or indulge in moral policing, the journalists clap. However, if there is a raid at a pool party or a rave party, where youngsters from the rich and upper middle class are found with drugs or other 'immoral' activities, this set of journalists get hyper-active and blame police of excessive action and using its energy in the wrong direction. This is aggravation of the same tendency which was witnessed in general cases earlier. Like in cases of accidents, if 10 persons die in a locality populated by low income group, it will not get the prominence, compared to even a few injuries in a mishap in a 'posh' locality. 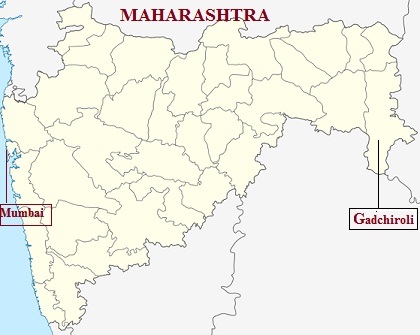 Seven commandos were killed in a Maoist attack in Gadchiroli in Maharashtra on May 11. As expected, this incident wasn't treated as a major news on electronic media throughout the day. But what was more surprising was that the newspapers seem to have gone extra soft towards Naxalites. There was a time, till a few months ago, when terms like 'Red terrorists', 'Left-wing extremists', 'Leftist militancy' or 'Radicals' were used after such acts. However, none of the newspapers used these words. Even words like 'explosion' and 'blast' were avoided. The headlines were too simple like 'Seven policemen killed in Gadchiroli' or 'Maoist attack leaves 7 cops dead in Maharashtra'. Of course, one doesn't expect 'screaming headlines' when a group other than suspected jihadis commit an act of any magnitude. But on this occasion, even the shock or anger over so many deaths was missing in the newspaper reports. The words used were not terrorists, extremists or militants, but REBELS, MAOISTS et al. Terminology, words play a very important role. Either the choice is deliberate or you just don't get the words while writing on killings by a group though you seethe with anger when the killers are different, leaves a lot to think. It has impact on society too. Naxal attack won't anger society as much, as newspapers and TV channels largely ignored it. One or two papers took it on their front page. A 'powerful IED' was used to engineer the blast that targeted police vehicle and later there was indiscriminate firing on police personnel. But neither the cops were 'blown up' or 'butchered' in media reports. They were just killed. Plain, straightforward reporting. At places, 'suspected Maoist rebels' was used. The use of words can increase or decrease gravity of any incident. The difference in coverage of incidents, shapes public perception. When there is such one-sided, blatantly biased reporting in cases where certain groups are suspect, and on the other hand softness shown towards certain others, it raises questions. Generally, there is anger over death of men in Khaki. No panel discussions were held in studios in the evening. Strangely, it appeared that these deaths were nothing 'unusual', unlike other cases when even 'no death, just injuries' in a 'terror strike' is seen as 'attack against nation'. Incidents like killing of 30-odd Congress leaders and policemen in Chhattisgarh were almost termed like terror attacks, but a lot seems to have changed. Now see the difference. Take the recent case of the blast in a compartment in a train in Chennai recently that killed 1 passenger (a woman). Even before it was clear that whether it was indeed a bomb or something else, the names of Muslim outfits were poured by anchors. Also, it was dubbed 'terror strike' instantly. This was the lead news of all newspapers. There has been no arrest so far and yet, the follow-ups continued for days.And just for the sake of record, we must talk about another incident--a genocide or a pogrom in North East. When 46 Muslims were killed in Bodoland region in Assam recently, the killers were termed as 'separatists' and 'insurgents'. At a couple of places, the word militant was used too. NDTV used the term 'violence' in Bodoland, so that the group involved in the attack, wasn't even named. Word play, isn't it! Shouldn't we wonder, why? One of the oldest Urdu newspapers in the country, the Mumbai-based 'Roznama Hindustan', has also launched its internet edition. Hindustan is now its 78th year. 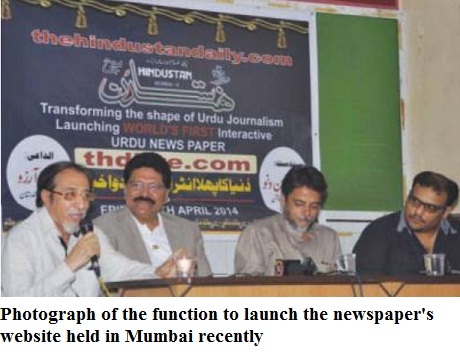 Along with Urdu Times and Inquilab, it has been an important voice of Muslims in Maharashtra and Western India. An interesting aspect about this website is that ti also has the feature of 'live streaming' i.e. videos of news [and events]. The aim is that people who don't read Urdu but can understand it, will be catered through the audio-visual medium, and they can listen to Urdu news from the website, said Sarfaraz Aarzoo, the editor of the newspaper, at the website launch programme recently. Among the 70 Urdu papers in India that are online, at least, 50 of these newspapers [including a couple of tri-weekly, weekly and fortnightly periodical papers], are well-circulated newspapers with substantial readership and their internet presence is adding to their brand. Around 20-odd publications don't have good circulation but have websites. Anyhow, this is no mean achievement as till just a few years ago, Urdu newspapers lacked as far as modernisation and internet presence was concerned. Now, Urdu dailies rival the other languages in the country, in terms of number of papers that are on web, and also the diverse layouts and presentation on their sites. Hindustan's website also has the children's and literary supplements online, and the readers away from Mumbai, can access the paper easily. It is good to see positive news emerging about Urdu. Let's stop talking in a depressing tone about Urdu. In fact, the most revolutionary changes are coming in the language in recent years. Those who are doing it should be praised and it should inspire others to take action, rather, than sitting and expressing sorrow. From the oldest newspapers of Delhi like Milap, Pratap and Punjab's Hind Samachar, newspapers from all the major Urdu publishing centres viz. Srinagar, Hyderabad, Mumbai, Patna, Aurangabad, Ranchi, Bengaluru, Kolkata, are now available online. Who had imagined till sometime ago that even cities like Beed (Maharashtra) would have Urdu newspaper, in print and also on web? If newspapers from Pakistan are added, the list will get too long. There are also Urdu papers published from Europe and America. Can the BJP double its existing tally in Lok Sabha to form next government in 2014? The Bharatiya Janata Party (BJP) currently has 116 seats in the Parliament. It needs to double its tally in order to form the next government at the centre. The party says that Narendra Modi wave will help it reach the magic figure of 272, which is required for a simple majority in the Lok Sabha. If the party gets anything around 220-230, it can hope to form the government with the help of its allies, under the banner of the National Democratic Alliance (NDA). Barely a week from now, it will be clear if the party is able to reach the figure. Do we need to even discuss it when just a few days remain before result of the 2014 lok sabha elections is out. In fact, the BJP's publicity blitz makes it appear as if 272 will be easily attainable for the BJP (even without allies). However, it is easier said than done.While it is true that there is disenchantment with the Congress-led UPA government. But getting almost double the seats is no mean task for the BJP either. From Gujarat, Rajasthan, MP and Chhattisgarh, the party is likely to get maximum seats. In Chhattisgarh, it will not be as one-sided though because the difference in Congress and BJP vote is quite narrow. The BJP hopes to do better in Maharashtra due to anti-Congress mood apart from getting substantial seats in Karnataka. It can't expect too much from South India despite its new coalitions in Tamil Nadu and Andhra Pradesh. In Kerala and West Bengal, a couple of wins would not help much. Now, what it needs is a good tally from UP and Bihar. BJP is hoping 50-55 seats from UP. Even most opinion polls and surveys show that BJP has gained ground due to 'Modi wave'. But the ground situation isn't as simple. BSP and SP have their core vote and it is more on the expense of Congress that BJP will gain. Can the BJP get 30-35 seats in UP? Even this number is not easy to achieve. In Bihar, it will be even more difficult. A state-wide analysis shows that in 2009 general election, BJP had got 19 seats from Karnataka. Can the party get as many seats again from the state? Secondly, NDA had performed too well in Bihar and had got 32 seats. While JDU got 12, BJP had 20 MPs from Bihar. In Gujarat, Orissa and MP, the BJP may do slightly better compared to last election. But in Punjab, BJP-Akali Dal are not in an advantageous situation this time. AAP is a factor here. UP had just 10 BJP MPs in the outgoing Lok Sabha and in this state BJP hopes to improve its figure. In Bihar, after the split with JDU, the vote share of BJP has come down. Can the 'wave' be so strong that it would compensate for it? Reports suggest Lalu Yadav-led RJD's resurgence in the state. If the BJP manages to reach 215-225, it will be an overall gain of 100-110 seats compared to 2009 elections. This will also be extraordinary performance. The NDA can then stake its claim to form government, as the single biggest coalition. Rahul Gandhi has said that if Congress doesn't get adequate number of seats, his party would sit in opposition, rather than support a third front government. This is pre-results talk and things can change later. The BJP campaign [and RSS] suggests that if the party doesn't get majority on its own and has to depend on alliance partners, even then it will not compromise on anyone, except, Narendra Modi, to be its PM candidate. The election has been fought on his name and it is definitely because him that the BJP cadre got energised. Let's see how far he takes the BJP from the present status [116 MPs]. Everyone is waiting for May 16, the day when EVMs will tell us, whom the Indian electorate has chosen to govern us. 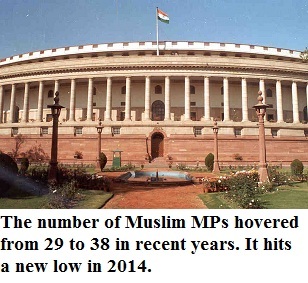 In certain states in India, especially, Madhya Pradesh (MP), Gujarat, Rajasthan and Chhattisgarh, it has become nearly impossible now for Muslims to win Lok Sabha election. But for decades, Betul, a constituency in central India, that has barely 2.5% minorities elected candidates belonging to the minority communities. In fact, it had been labelled as a minority seat. For decades, not just winners but opposition candidates here were also Muslims. The constituency came into existence in 1967. In the first two elections, veteran Congress leader, late NKP Salve, a Christian, won from here on Congress ticket. After his victories in 1967 and 1971, he lost the election from here in 1977. Subhash Ahuja who contested on Lok Dal ticket, had won that year. 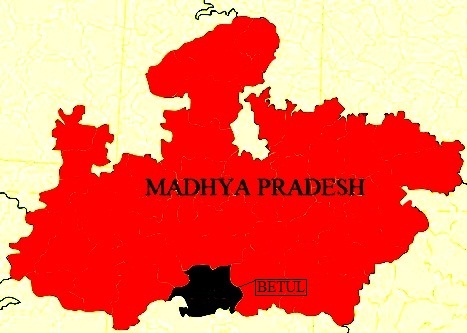 In the year 1980, Congress strongman from Bhopal, Ghufran-e-Azam contested from Betul and got elected from here. He defeated Bharatiya Jana Sangh (BJS) candidate Subhash Chand Ahuja by nearly 30,000 votes. In the next election, in the year 1984, former Olympian [hockey player] Aslam Sher Khan won from this constituency. He fought on Congress ticket and defeated independent candidate MN Buch, a retired bureaucrat, by a margin of 37.950 votes. Five years later, yet another famous Muslim leader Arif Beg [recalled for his 'mere mulk ke maaliko' address for the crowd in election rallies], contested from here. Beg was fielded by the BJP. It was the era of Ram Mandir movement. Beg defeated Congress' Aslam Sher Khan by over 40,000 votes. But two years later, Aslam Sher Khan avenged his defeat. In 1991 election, Aslam Sher Khan, who fought on Congress ticket, defeated BJP's Arif Beg, by 22,733 votes. In 1996, BJP gave ticket to Vijay Khandelwal, who defeated Aslam Sher Khan by a huge margin. It was post-1992 era, communal polarisation had begun in MP, and it was becoming nearly impossible for Muslims to win even in the Assembly elections. Congress tried a minority candidate from here, just once, after this defeat. In 1999, it gave ticket to Ghufran Azam. he secured over 2 lakh votes (nearly 39%) but lost by a margin of 64,000 votes. Since t hen, neither BJP nor Congress fielded a minority candidate. But the seat is an example o.f how minority candidates have won [and can win] from constituencies where they have very small concentration. This is really the beauty of Indian democracy. The overwhelming majority of Hindus voted for Muslims at this seat and helped launch the political career of the Muslim politicians. In 32 years, there were ten elections here. Of the 20 candidates who won and lost here, 12 were from minority community. Often the winner and loser were both Muslim, despite the fact that minority communities are barely 2.5% of the population in this constituency. It is easy to blame parties for not giving proper representation. But the fact is that there are few leaders worthy of ticket in the region. The first and most basic job of a a politician is to remain active in their area. If they work in the constituency and nurture it, people will remember them and even reward them. However, they expect that the party would give ticket and this should be enough for them to sail through. And those who lose once, just leave the area--going to State capital or national capital, forgetting the electorate. Times have changed, they must realise. Everyone knows Bano Bi, an elderly Muslim woman, in Mandsaur, a district in Western Madhya Pradesh. Bano Bi is 70. But she loves to fight elections. This year it is no exception. She is again in the fray for the Lok Sabha. The elderly woman has been fighting Lok Sabha [Parliamentary] elections since 1991. Also, she has fought Vidhan Sabha [Assembly] elections regularly, apart from a civic body poll. Though she is always contesting polls, people don't feel that she is there just to cut the votes. They know it's her passion. Once, she had even come third after the Congress and BJP candidates. Bano Bi knows that she doesn't have a strong chance. But she feels that it is important to contest. Her family members support her in canvassing and in arranging the funds for running the publicity campaign. Bano Bi is fighting on the ticket of Bharatiya Minorities Surkasha Mahasangh (BMSM). The BMSM is a basically a politically party with roots in Maharashtra, where it puts up candidates. The BMSM's national president is Sundar Shaekhar, who is the adopted son of Haji Mastan, the Mumbai-based underworld don who had later tried his luck in politics too. Mastan couldn't get success in his avatar as a politician. The election scene is quite interesting in Mandsaur constituency. Congress' Meenakshi Natarajan is hoping to retain her seat. BJP has fielded Sudhir Gupta. The maverick Paras Saklecha has been fielded by Aam Aadmi Party (AAP). The BSP has fielded an interesting man, Kranti Parivartan. Besides, only a few other recognised parties have fielded candidates viz. All India Forward Bloc (AIFB) that has fielded Sheikh Azizuddin Qureshi, Bahujan Mukti Party [Raju Malviya] and Bahujan Sangharsh Dal [Banshi Patidar]. The electorate in Mandsaur have voted, and it will be clear in a fortnight, who will be their new Member of Parliament (MP). Bano Bi is happy at contesting the poll. Once the election is over, she will start preparing for the nagar palika [municipal corporation] election which will be held soon.